﻿ 3D LED Cube Control - SEEKWAY TECHNOLOGY LTD.
· Provide considerate customized solution to customer, accompany with Seekway software and 30 sets of real 3D animations. 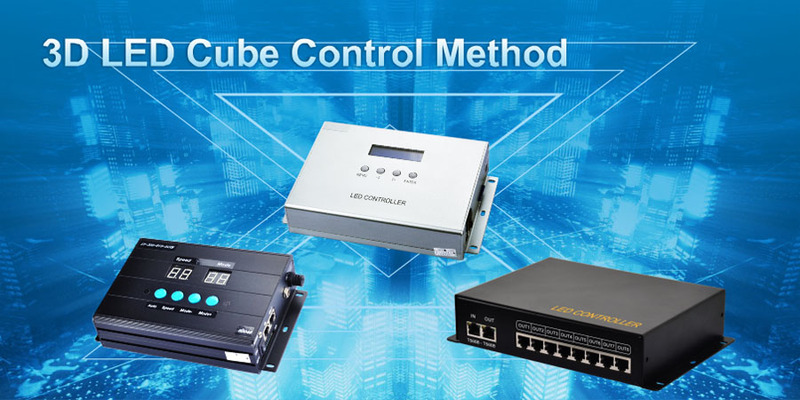 The control system includes SD card control, Ethernet PC series, and etc. Users can edit text, logo and convert 2D pattern into rotary and symmetrical 3D effect by Seekway software. · Control large-scale 3D display or achieve linkage between different 3D displays through several cascade controllers. · With PC and SD controller, user can select the control system to be PC control or SD card control. · For the uses who are skilled in controlling stage lighting, we developed Artnet-DMX controller DAN508 to support DMX lighting software such as Madrix and etc. Users can prepare software and produce 3D effects by themselves. DAN508 controller has 8-port output, each controller has 4096 channels. Several controllers can work together in cascade connection. Through connecting with T-cables to drive 3D tubes and can be widely used for decorations in stage, night club and etc. · For professional users, we have Artnet-Usart large capacity controller DAN504. Each controller has 12288 channels. Several controllers can work together in cascade connection. Support DMX lighting software like Madrix and etc. Use with specialized sub-controller which can be set in LED tube. · For professional software users, we have developed DVI 3D control system to support cutting 3D effect into slices and displaying them in a plane. Users can make the 3D animations through cutting 3D effect into slices by our developed technology and display on 3D device through DVI screen capture.